My latest addiction today is to crochet with Plarn. Do you know what that is? I am talking about plastic bag yarn. 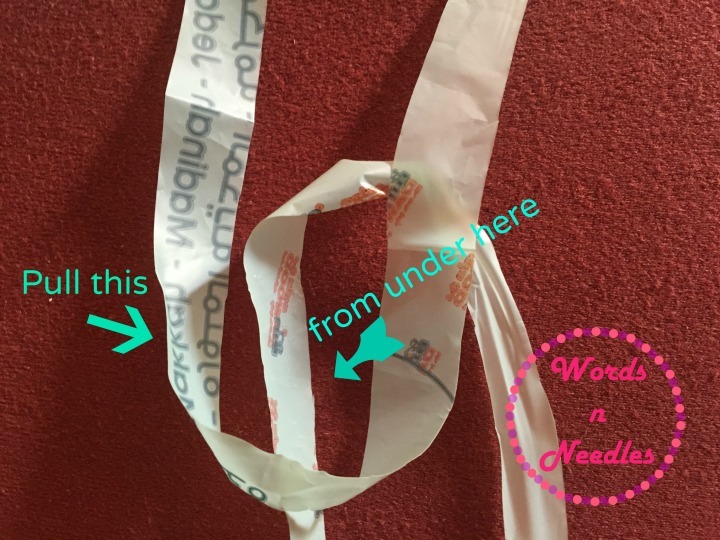 Don’t worry if you don’t because today I am going to show you how to make plarn from grocery bags or plastic bags at home in just a few minutes. You know how we love to play with junk and I am always looking for ways to use up the things in my home. I have been crocheting with plastic for years but never really made my own. Yesterday, my husband brought home some really pretty grocery bags that made me pick up my scissors and cut them up. In less than half an hour, I had even crocheted the bag away. Plarn is available at most crafts stores too. My mother had taught us to use these to decorate our sock baskets when we were young. 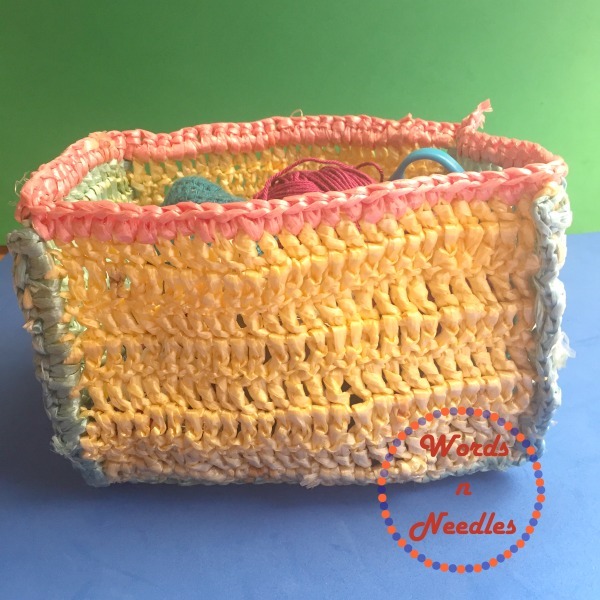 I had a few balls from my childhood that I had used to make this little basket with the scraps a few years ago. It is fun but it is addictive! I must warn you. I have found that even my toddler loves playing with it. Of course, I had to come up with creative ways to make sure that these were safe for a two year old. My 7 year old was intrigued that mom actually makes yarn from anything! Here is what you need and how to go about it. Fold it in half (as shown in the picture below). Cut off the handles on the bag and the sewn end at the bottom. Cut strips 1 to 1 and half inch wide. Open two strips and lay them as shown in picture. Pull the second strip (at the arrow mark in picture) and pull tightly but gently till it is all out. Continue with the remaining strips. Pull the knots a little more tightly and scrunch the yarn from beginning to end. Place two strips over each other and pull them through as shown to knot them together. 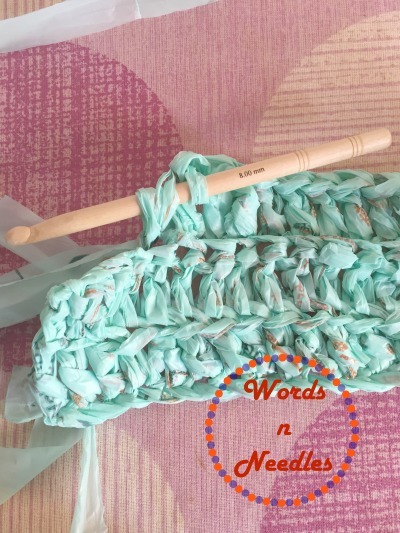 Step by Step instruction to make plastic bag yarn. 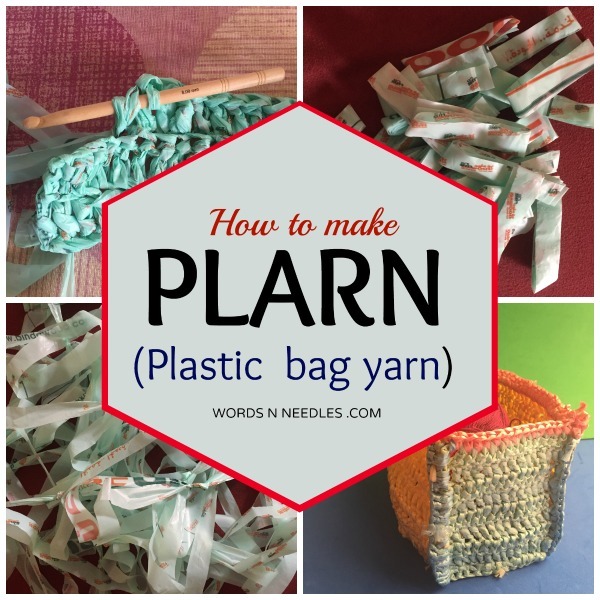 Isn’t it really easy how to make plarn from grocery bags? I like to leave the yarn in a basket or on the floor while I work and not bundle it up into a ball. Remember, don’t tease the yarn too much as this yarn crumples. Don’t hook it up and then pull it off to do it again. It may tear. Here is how much I made with one bag. I am not sure what I am making but do come back to see what I made. Have you made or worked with plarn before? Tell me your experience in the comments or hop on over to my Facebook page. I would love to hear from you! Very informative post! Hearing about “plarn” about first time. Thanks for sharing! Thanks for stopping by Dhiyana! Yes, I heard the term a few years ago too. I used to call it plastic yarn before. They had a huge recycling effort in our city a few years ago. I’m so excited to make my own plarn (from all those plastic bags that somehow make their way into my home despite the fact that I use cloth bags when I go shopping). 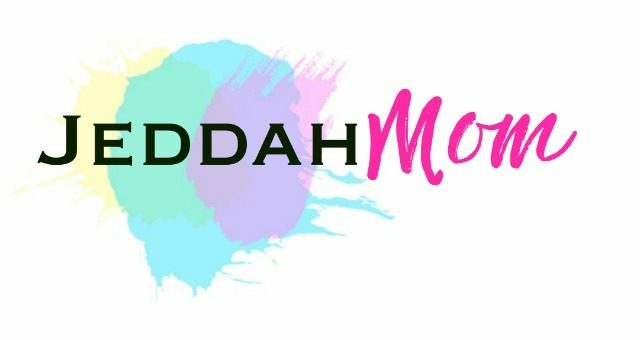 I’ve pinned and would love if you shared at the This Is How We Roll Link Party on Thursdays at Organized 31. Thank you Susan! I know… They just creep in to our home no matter how much we avoid them too! Thanks for inviting me. I’ll remember to be at the link up. we collect bags at work to give to a corrections facility. The inmates use the plarn to make blankets for the homeless. They are quite beautiful. What a noble cause! Thanks for sharing. I hope it inspires others with what you are doing. Love plarn! Made from grocery bags is easier to work with, but started running out of those since I bring my own, so started using the bags bread and such comes in. I cut up the bags as I empty them and wait to loop the mix into thread in very small batches as I need it. That helps avoid a discolored look when companies change their bags or the colors aren’t exactly the same in different batches. Also, watch to make sure the bagger doesn’t shove meat into your plarn market bag. Had to throw that one away when I didn’t notice what he was doing =( I hope this link to my latest one works. How or where do I get the book or a printable instruction for making plain?